When I was younger, I was enthralled with Bionic Commando on NES. Since this was a no save game I had to play through it straight. Played so much that I was almost done. Had to go to a Cub Scout weekend outing or something. Left the system and my tv on all weekend so I wouldn't lose progress. Came home and finished it that night. Killing Hitler and the whole experience was so freaking memorable to this day. Still one of my all time favorite games. Re: Favorite childhood memory playing a game? I fear this thread is quickly going to make me feel old. When I was younger, I was enthralled with Bionic Commando on NES. I have to list 3...sorry. They are true to the thread though. Opening my NES on Christmas morning and playing Excitebike for about 15 minutes before having to go to my grandma's for Christmas. Getting Mike Tyson's Punch-out on day one and being super addicted. My friend picking up Double Dragon and bringing it over and playing it all night for a sleep over while eating Doritos and drinking Mountain Dew. We played some Metal Gear and Track and Field in there too. I'm pretty sure we only slept a couple hours that night. We played some Metal Gear and Track and Field in there too. I'm pretty sure we only slept a couple hours that night. Oh man, I remember playing Metal gear on the NES! There's something about those olden days playing a game like that, where you can't instantly look up solutions on the internet. I remember playing Metal Gear: Snake's Revenge and being super annoyed with it though. All those actiony parts they added to the game sucked! I called the Nintendo power hotline more than a few times on Metal Gear. It seems so strange to me now. Calling them up and talking to a real person on the other end. Trying to explain what I was stuck on. They were always quick to catch on though. All after I called them from my parents rotary phone. Wasn't a big fan of Snake's Revenge. There was an arcade in a nearby Mall called the Fun Tunnel. I lived to play Battlezone, Robotron, and Tempest. So many quarters were spent. Later on it was Sinistar and Gauntlet. I never had a console until I bought my kids a Sega Genesis in 1991. Growing up we were too poor for an Atari. That reminds me of a great arcade memory ... I was so young, and would go to the arcade with maybe a $1, and then spend the rest of the day just watching other people play. My father was an avid gamer while I was still a tiny little thing, although given the era, home gaming for him meant his wood-paneled IntelliVision (well, and Pong, which must've been gone before I came around, and an Aquarius that I have no memories of being anywhere but in his closet next to a small stack of games). As a family Christmas present in 1988, he bought an NES as a family gift. At first, he was far and away the best of the four of us at Super Mario Bros. I was hanging out with some of my friends down the street, and one of 'em showed me the warp zone trick in 1-2. I went home and pulled off the same thing during our next family gaming session. At 10 years old, I unseated him as the King of Video Games in our house, and he'd never reclaim that crown again. 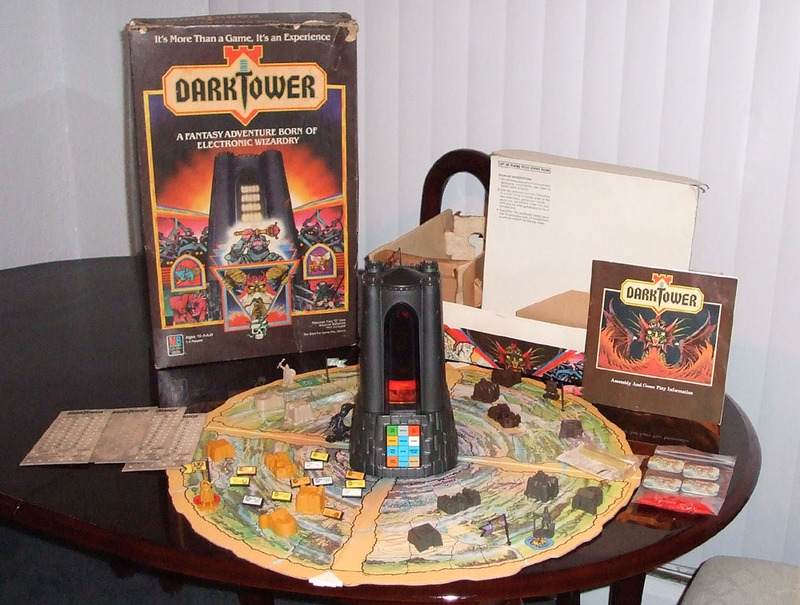 Yes it's a board game, but in 1981 it was the only board game that came with a computerized encounter/combat/treasure dispersion CPU. DARK TOWER was amazing. I didn't own it; my buddy Dave Evans did. 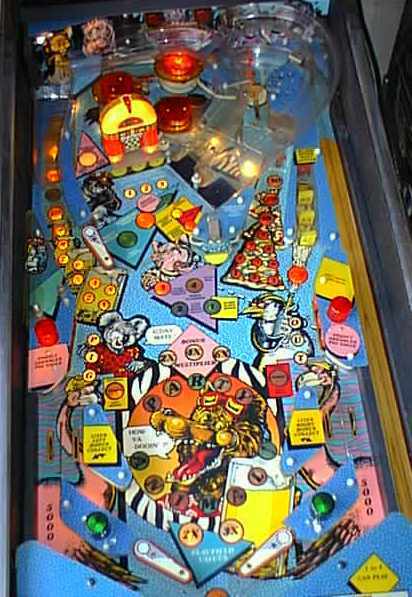 We were both 10 and played this for HOURS during the summer while watching late-night horror/scifi movies over pizza, root beers, and ice cream. Because you can consume anything at age 10 and shake it off. I can't begin to describe how much fun DARK TOWER was. Unfortunately it was eventually sued out of existence, and complete working sets go for mondo bucks on eBay. EDIT: Why even the writer/director of Citizen Kane agreed!! - Coming home from school and having an NES setup on a pool table with Super Mario Bros scrolling across the screen. Nothing special, but just a lot of fond nostalgia around videogames when I was a kid.